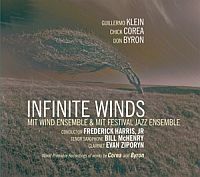 On their new and musically diverse release Infinite Winds, the MIT Wind Ensemble and the MIT Festival Jazz Ensemble present three long form compositions by three diverse and highly regarded composers: Guillermo Klein, Chick Corea and Don Byron. The three pieces were each recorded in their world première performances. Klein’s Solar Return Suite and Byron’s Concerto For Clarinet and Wind Ensemble feature special guest performers, saxophonist Bill McHenry and clarinetist Evan Ziporyn, respectively.